Kevin O'Boyle reports that while conditions were not favourable for trout, in saying that the anglers who ventured out had some good sport. Extremely low water levels and calm, warm dry weather did not help. Fishing from the Pontoon Bridge Hotel, Ross Wade from Dublin had 3 keepers just above 1lb (all released) and encountered numerous more fish. 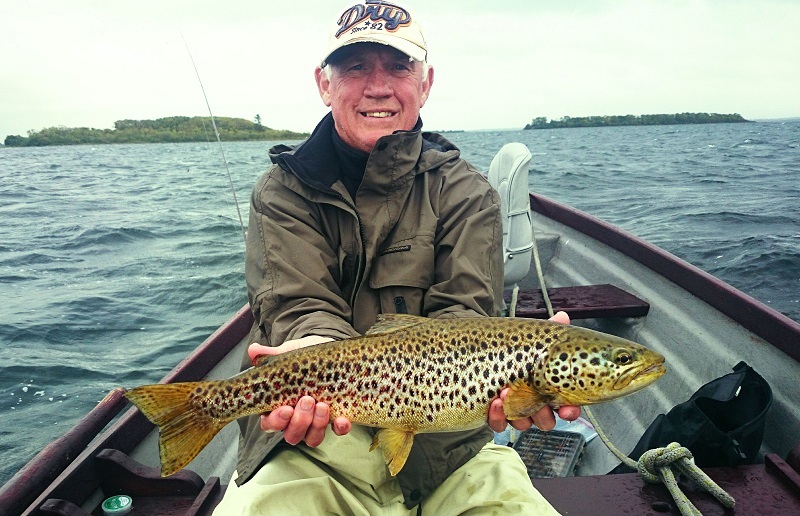 Alfie Hanafin from Dublin landed 4 trout for 5 lbs on a dry daddy, mostly off Glass Island. John and Claire walsh, Kildare, landed 7 trout for 10 lbs , mostly taken on wet fly patterns. Peter Giddings, Wales, had 8 keepers on a dry daddy pattern, all around Six Arch Bay. Elsewhere, Richard and Gary Binley, Foxford, averaged 3 keepable trout each day over 5 days, all on Daddy and dry patterns. John Powell and Ian Hanson, Cardiff, Wales, had 3 trout each, averaging 1.25lbs on various wet patterns. Kieran Concannon and Alfie Begley, Donegal, landed 3 and 2 trout respectively on dabblers. Adrian Murphy from Cloghans landed a few trout including 1 fish of 3 lbs on a Claret Dabbler. The "Foxford Angler of the Year" Stephen Browne, Knockmore, Ballina took 5 trout over 2 evenings on dry fly. Young junior local anglers, brothers Brendan and Cormac Murphy from Cloghans had some good evenings fishing with dad Adrian. Cormac had a trout of just over 2lbs trolling a Mepps, while Brendan had 5 small trout all around 1lb trolling wet flies. Peter Byrne, Castlebar, landed a 3.5lbs salmon on fly in Victoria Bay while trout fishing, as did Liam Walsh, Castlebar, who landed a salmon of 6lbs, also while fly fishing for trout. 8 year old Cormac Murphy, from Coghans, with a nice trout he caught while fishing on Lough Conn with dad Adrian and brother Brendan. Fishing guide Kenny Sloan reports that due to the low water conditions on the Moy system, anglers were turning their attention to the other species, particularly pike, on the many loughs around the area, with fly fishing and trolling being the most productive methods. All-round angler Michael Weisser, who has been visiting the Foxford area for over 20 years, would normally fish for salmon, but still had a great holiday thanks to the magnificent pike angling in the area. Michael managed to catch two of his best pike ever at 1m, and 1m 6 cms, or 21lbs being the largest. A total of 11 pike were caught, the smallest around 10lbs. All fish were carefully returned so that other anglers will have the chance to catch a fish of a lifetime. Michael Weisser from Germany, a long time visitor to the Castlebar area, with one of the fine pike he caught recently. With the end of the game angling season, it's time to look back at what was, for salmon anglers, a disappointing year, but for trout anglers, not bad at all. Following a slow start to the season, the western lakes took off with a bang come mayfly time. Some of the best fishing in years was reported, and a similar pattern was seen on trout lakes around the country, with great reports heard from Ree and Sheelin in particular. However, local anglers were hard to tempt to travel, as the fishing was consistently good on Corrib especially throughout the month of May. Good hatches were helped by fair weather, with pleasantly warm air temperatures and moderate winds, making wet and dry fly fishing a pleasure for much of the time. It will be remembered as one of the better mayfly seasons in recent times, and hopefully is a sign of things to come. Salmon angling, on the other hand, was not helped at all by weather conditions this year. Off hand I can only recall one good flood in the Connemara spate fisheries for the whole summer, and the long dry summer had most rivers at their lowest levels seen in nearly 20 years. Salmon runs were also poor, even when rains brought some relief the numbers of fish were disappointing. Sea trout fishing also suffered due to the dry summer, but some fisheries reported reasonable fishing at times, including Costello & Fermoyle, and Lough Inagh. I hope to have a few end-of-season reports from the various fisheries for next week, as I'm sure the fishery managers have had a busy time over the last week. Frank Reilly reports that the fishing season ended on Corrib with some good catches to report. Lloyd Vincent from England, fishing with Larry McCarthy, landed 12 good trout over 4 days to 4.5lbs, fishing dry fly. Ian Mackintosh from Cork, also fishing with Larry, landed a cracking 6.5lbs trout on a dry Daddy pattern. Edith and Chris from Belgium reported excellent fishing in the Inchagoill area, landing 10 fish averaging 2-3lbs on Tuesday, and more fish again on Wednesday, including a fine trout of 6.5lbs, fishing wet and dry Daddy patterns. There were several competitions held over the last few days of the season. The Headford club held a match with the Fermoy club from Cork on Saturday, with 54 rods landing 36 trout over the limit. Top rod was Peter Driver from Kilkenny, with 4 trout for 5.3lbs. Second place went to Corkman Dinny O'Brien, with 3 trout for 4.7lbs, and third was Ger Kenny from Ennis, with 3 trout for 4.2lbs. The heaviest trout was landed by Cork's Bobby Barry, with a fine trout of 3.5lbs. On Sunday Headford Anglers held their Last Cast competition, with 32 rods landing 16 trout. Sean Dixon from Ennis took top honours on the day, with 3 trout for 6.9lbs. Second place went to Eamonn Neligan from Cork, with 3 trout for 4.8lbs, and Bobby Barry was third, with 2 trout for 3.9lbs. Finally the Garda West angling club held a last day competition on Tuesday, with 10 anglers landing 9 trout. First prize went to Barry Carolan, with 3 trout, Peter McGuinness took second place, also with 3 trout, and Christy Reilly was third with 2 fish. To round off the season, young Oisin Reilly showed he really has the measure of dad Frank now, catching 4 trout to 3.5lbs, beating Frank's 2 fish. Oisin's fish were mostly taken on a yellow Gorgeous George pattern. Lloyd Vincent with a lovely 4.5lbs Corrib trout taken in late September 2014. Ronan Cusack looks back at the 2014 season on Mask. Mask closed its doors to trout angling on Tuesday evening last, after a very mixed or maybe even one sided season. This year got off to a particularly slow start mainly due to the extreme flooding we experienced in early spring. Many locals in the area said the lake reached levels this year never seen before. Yet by midsummer, the lack of rainfall meant anglers were nervously tip-toeing around the lake, trying to avoid shallows which have not been exposed for years. My first outing on Lough Mask this year was not until late March and this was with good friend and well known Mask angler Kevin Egan. We focused our attention on Cushlough Bay, using various wet fly patterns on intermediate lines. We finished that evening with 7 trout, 2 of which exceeded the 4lbs mark. All trout were in excellent condition and did not seem to have suffered any hardship over the winter months. As the season progressed, water temperatures rose and fly life got more prevalent. Buzzer and Olive hatches were reasonably good in April and early May, with excellent fishing reported on a weekly basis. The first sign of Mayfly this year was around the second week of May. Hatches were what I would describe as "well up on other years". The last week in May brought strong NW winds and resulted in some unbelievable wet and dryfly fishing. My best day was with visiting UK angler Pete Dighton on the 30th of May. We finished that day with in excess of 30 trout exceeding the 13" limit pulling wet mayflies. Pete is a regular visitor to the west of Ireland and always assumed that catching numbers of trout like this only applied to stocked fisheries. As the Mayfly faded away, the sun continued to shine and barbeques replaced fishing tackle in most cases. Mid July approached and once again anglers began to focus their attention on the lake. The much sought after World Cup was just around the corner and homework needed to be done. By now surface water temperature was over 20°C and the majority of trout in the shallows had moved to the cool of the deeper water. At this stage trout were few and far between and your best chance of any sport was early morning before the day warmed up, even on days which were suited to angling. The 28th of August brought the only heavy downpour of rain for weeks, which lasted almost 24 hours. This seemed to cool and freshen the lake and trout responded well for the following few days. Unfortunately for anglers, this was short lived and as predicted, the Indian summer settled in and the tough fishing resumed. Already looking forward to the 2015 season, so it's back to the vice now and try fill in those gaps in the fly boxes. Ronan Cusack with his best trout off Mask in 2014, a lovely 7lbs fish taken on a buzzer pattern in early May.